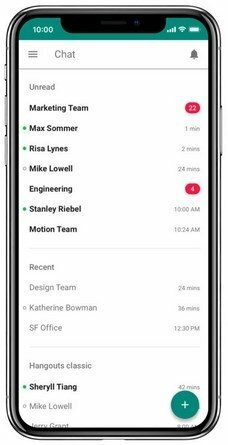 Hangouts Chat is Google's proposal for communications in the business field, a messaging app that combines all the functions necessary in the work environment. 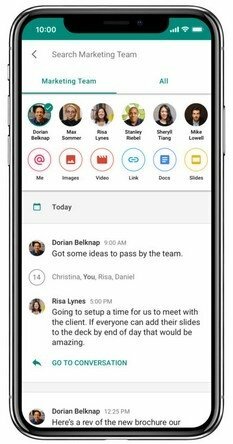 The idea is to make communications between members of the same company much faster and more efficient, for which purpose it comes along with private chat rooms as well as group channels where all members can get together. One of the most interesting things about this tool is that if you use the rest of Google's service, the integration is fully comprehensive. This helps to encourage teamwork and simplified sharing information with other teammates. Instant chat tool for companies. Share data from all Google's G suite. Carry out searches straight on Google. Built-in word and conversation search. Plenty of access and privacy configuration options. Hangouts Chat is a tool clearly focused on the professional world with everything necessary to make sure communicating isn't a problem. It's obviously the alternative from the guys at Mountain View to compete against Slack, one of the most popular programs in this kind of environment. 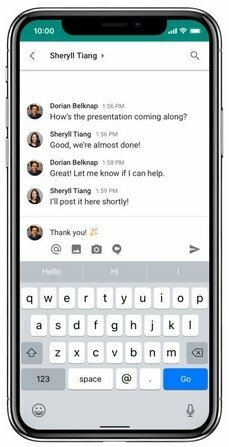 If you own a company that requires constant communication between its workers, it's your perfect option, and if you're just a worker, why not suggest the implementation of this app in your business? It will definitely improve the productivity of your work environment.